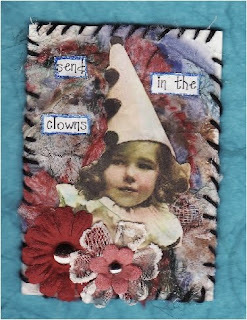 This past week I have been enjoying making some ATC's again. 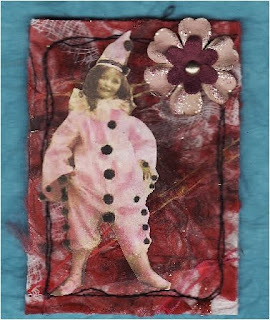 I have not made one in quite some time so now that the holidays are over I can concentrate on one of my papercrats and that is ATC's. The above ATC's are done with transparency overlays. 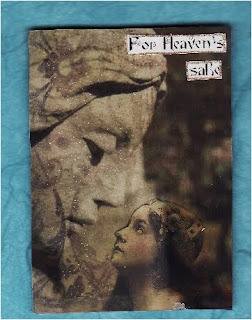 The For Heaven's Sake is done with some beautiful BoBunny glittery flourishy scrapbook paper, then I glued the smaller image down then I printed off a Graveyard Angel statue on the transparency looking down. I love this image and the composition. 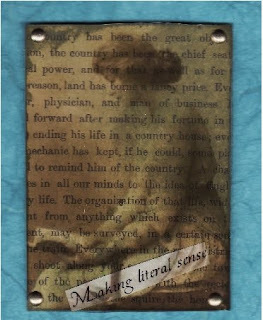 The Making Literal Sense is distress inked book page then a woman reading a book printed on transparency and again overlayed on the background paper. I just love this layered look. These cards are up for trade on the ATC for Beginner's group but if anyone is interested the first one to email me will be considered. I don't often make more than 1 of the same card, just something I like to keep as a OOAK but in some instances if someone really likes the card and it has been traded I do make exceptions. Below is another new technique I tried from Bernie Berlin's ATC Workshop book and it is fused fibers. You make a nesty of fibers large enough to cover an atc background size then using fusible webbing you fuse the fibers together and with ironing it all eventually lays ftat. I have also cut up some cheesecloth and placed bits here and there and it becomes a beautiful textured background. I added the flowers and thought this was a good clown background. I have named these two...Send in the clowns 1 and 2 respectively since these will be considered a series of 2. I have some other cards in the making, some just need names or titles and then a few others need little embellishments. I also have some painting projects lined up and some more challenge cards to make. I was doing well last week but this week I kind of slipped but I can make it up. I have cards precut and some ideas and things to use up so I won't be lacking any ideas or materials. Thanks for dropping by and stay tuned for some more of my musings. ahhh Les, how gorgeous are these, i bet they go quick. i've alredy sent you an email! They're all beautiful - but 'literal sense' just sings! I'm hoping to get into ATC's this year and your work is inspiring. I'll stay tuned in and one day maybe good enough to have a swap! Lesley your ATC's are really nice. I'm into to much at the moment to try making ATC's maybe later into the year. Hi Lesley! 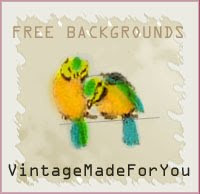 Your blog just excites me and I'm thrilled to have found you and your artwork thanks to the OWOH event. You're a Canadian too!! You had mentioned that you like to trade atcs. I'd be up for this anytime. 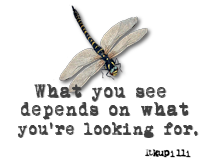 Just send me an email (email address on my blog profile) if you are ever interested.